San Diego writer Janet Wilson has a mission: to entice reluctant second- to fourth-grade boys to read more. But a technology giant wants to greatly curtail her efforts. From her kitchen table, she’s designed a book series around boy-friendly tales of speed boats, planes, off-roaders and race cars. Nestled around the action photos are words necessary to decipher the action using age-appropriate vocabulary. It’s a clever way to make skeptical boys see reading as a fun activity. Today her books are printed and online, but the gaming giant Zynga wants future technology such as social networking, software and games to be off-limits. Also in 2008, a tiny startup with a name resembling leftover scrabble letters bought Yoville. 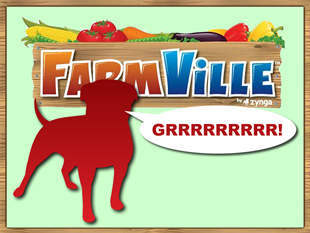 Zynga later morphed this acquisition into Farmville, which has exploded in popularity over the last couple of years as millions used Facebook to grow and harvest virtual produce. Zynga grew with stunning velocity and is now a publicly traded corporation employing hundreds. Undoubtedly, Lucasville, Yoville and later Farmville borrowed the suffix "ville" from the French word for town popularized in the United States by locales such as Louisville, Gainesville, Jacksonville and likely dozens if not hundreds of others. In spite of its widespread use, Zynga has decided to lay claim to nearly all uses of the word "ville" on the Internet. Big companies like Chevron with Energyville and little companies like extrafeet that use eVille (a pun on the word evil) have received demands to limit or cease their use entirely of their ville-fied word. Zynga’s wholesale attacks have earned it fourth place on Trademarkia’s biggest bullies list alongside industry icons Kellogg and Apple. Not just profit-hungry corporations but even nonprofits are laying claim to common words or phrases for their exclusive use. Second on the trademark bullies list is the Lance Armstrong Foundation, which has laid claim to the word "strong" and attacked others’ use. including Shelf Strong, Be Strong, Christ Strong and more than 70 other variations. The Susan G. Komen Foundation popularized the slogan "Race for the Cure" and has gone after 50 others for their use of "for the cure." Apparently the search for a breast cancer cure is the only meritorious medical quest. Which brings us back to Janet and Lucasville, her one-woman effort for literacy. Zynga claims people will be confused and think that Lucasville is Farmville, but that seems about as likely as someone confusing Nashville and Farmville. The company is blocking her attempt at registering a trademark for Lucasville and telling her to cease all uses of Lucasville. A settlement has been proposed, but Janet must agree to greatly restrict future development of Lucasville, avoiding social networking, games or software. While Lucasville is paper and online books today, learning is changing and social networking and game mechanics (turning learning into a game) are growing in popularity as effective instructional tools. It’s understandable for a company to want to avoid confusing consumers, but Zynga didn’t invent the word "ville." It had a generic and dictionary connotation of a community long before Zynga decided to use it. Nobody can make the case with a straight face that Lucasville, which existed before Farmville, is leveraging the notoriety of the simulated agriculture sensation. It’s one woman’s effort to improve the world. As someone pursuing a labor of love, Janet doesn’t have the resources to fight a lengthy or even short legal battle. Zynga, the Lance Armstrong Foundation and the Susan G. Komen Foundation have prevailed in many of their attacks to lay claims to generic words or phrases simply by the threat of costly legal battles. These corporations aren’t evil or villains, but they do suffer from overzealous legal departments that need to be reined in by more engaged management. Perhaps the clever folks at Zynga can devise a way to continue to build their company while Janet strives to lure more readers to Lucasville. A straightforward disclaimer noting no relation to Farmville would seem to be sufficient. Let’s hope Zynga reconsiders its position – or else its recent $200 million acquisition of Draw Something could mean we’ll need to remove “something” from our lexicon next.